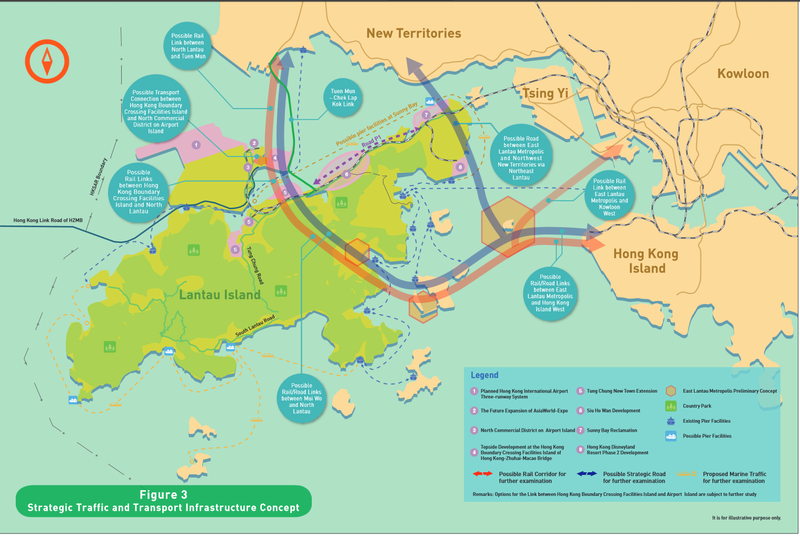 Lantau’s transport future: Back to the boat? Until the 1950s, the only way to get around Lantau, apart from walking, was by sea. Now, even with the looming spectre of a bridge to Central, water-borne transport could be making a comeback. The LanDAC work report suggests expanding ferry services around Lantau, with new piers at Tong Fuk, Shui Hau, Fan Lau and Sunny Bay. Services would also run to the Sokos Islands, Tai O, Sham Wat, Sha Lo Wan and Tung Chung. LanDAC isn’t clear about whether these should be regular passenger services, but says they could help cope with peak and holiday passenger loads. This harks back to one of LanDAC’s early ideas, which was take the load off the existing infrastructure by putting tourists on cruise ships from Kai Tak. This fell through for a number of reasons, one being the size of the vessels. But the idea has been given extra currency since the shutdown of the Kap Shui Mun bridge in October, which cut all road and MTR links to Lantau andChek Lap Kok. Waterborne transport saved the day, although 100 people still missed their flights. Extra ferries were deployed from Central to Discovery Bay and Mui Wo, More vessels were on standby to ply from Tsuen Wan West to Tung Chung, but were not required. The incident has brought the vulnerability of the single link into focus. One solution, the bridge-tunnel between Chek Lap Kok and Tuen Mun, is still under construction. LanDAC say it may come on stream as early as 2018, but that may be ambitious given the problems of the whole HK-Macau bridge scheme. Others have called for introduction of a ferry service from Tsuen Wan to Tung Chung, and the opening up of the SkyPier at Chek Lap Kok for regular passenger services. Currently it is restricted to airline passengers commuting between Hong Kong and nearby mainland cities. Those are not bad ideas – simple, tourist-friendly solutions to Lantau’s transport issues. But a big hurdle is the rigidity of the Transport Department. According to a study by LIM, its process for handling the islands ferry franchises hasn’t changed in 60 years. Every three years it puts out a three-year tender for each of the islands routes. Inevitably, these aren’t profitable and require a hefty annual subsidy. Clumping these together into a single long-term franchise would give a ferry company the chance to get the scale to improve the service and invest in new, cleaner-burning vessels. This is just the kind of issue, important to both residents and tourists, that LanDAC should be dealing with. But it’s not as grand or as profitable as dreaming up a whole new CBD. Unless the government dangles a big pot of money, it’s unlikely we will see any change in ferry services.